In 1954, as Japan struggled to rebuild its shattered infrastructure and become a global economic power, Joseph M. Juran traveled to Tokyo to share some of America's savviest industrial know-how. He ended up finding quality improvement an easier sell in Japan than in the U.S.
At a time when the "Made in Japan" label invited mockery, Japanese industry readily adopted the Western ideas on how to improve its products. With decades of effort, the country developed an international reputation for high-quality exports including cars and electronics. Mr. Juran thought many American companies were less interested in quality -- in part, he theorized, because upper management was dominated more by finance specialists than by executives with production expertise. When asked by middle managers how to get upper management interested in quality, he said his advice was, "Pray for things to get worse." Mr. Juran, who died Feb. 28 at age 103 at his home in Rye, N.Y., was the second American to bring the gospel of quality to Japan, the first being W. Edwards Deming, who started a couple years earlier. While Mr. Deming's contributions were strongest in statistical methods for quality control, Mr. Juran focused more on the management part of the equation. He liked the slogan, "There is always a better way; it should be found." Although producing higher-quality goods might seem costly, he argued, it could often pay for itself through fewer repairs and a better reputation in the marketplace. Having noticed that a small number of problems produce most quality complaints, Mr. Juran formulated his "80-20" rule, which stated that 80% of a firm's problems stemmed from 20% of causes. Management should concentrate on the "vital few" rather than the "trivial many." He called it his "Pareto principle" after economist Vilfredo Pareto, a 19th-century Italian economist who noted that 20% of the population owned 80% of the property in Italy. Raised in a tarpaper shack in Minneapolis, Mr. Juran was the son of a Romanian immigrant shoemaker who turned to bootlegging to supplement his income. In his 2004 memoir, "Architect of Quality," Mr. Juran writes that he held 16 jobs by the time of his 1924 graduation from the University of Minnesota, including chess columnist for the Minneapolis Star. Soon after graduation, Mr. Juran was hired by Western Electric Co. at its mammoth Hawthorne Works manufacturing plant in Cicero, Ill. At Hawthorne, more than 25,000 workers made telephone equipment for Western Electric's parent, the American Bell Telephone Co. Hired to work in the complaints department, he became an inspector in what was in effect one of the first statistically based quality-control departments. Hawthorne was a nursery for industrial sociology. "Human-factors engineering," which paid attention to how things such as communication and fatigue affected the assembly line, got its start there. Mr. Juran told of using statistical techniques he learned to beat a local roulette wheel operated by the Capone gang. Also working at the same factory at the same time was Mr. Deming, but the two didn't meet until the 1940s. 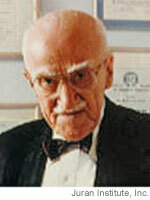 After World War II, Mr. Juran moved to New York as a professor of industrial engineering at New York University, while also working as a consultant to companies including Gillette Co., where he helped cut costs while streamlining production of razors. In 1951, he published the "Quality Control Handbook." The book made his reputation and eventually sold more than a million copies. He left NYU the next year and spent the next half-century as a management consultant, and was author of dozens of books about quality management. His theory of quality-control management concentrated on what became known as the Juran Trilogy: planning, control and improvement. The idea was to create a management-led culture of continuous quality improvement. In demand by some of the largest companies in the country -- in his memoirs, he citesXerox Corp., Motorola Inc., and Merck & Co., as well as the U.S. Navy -- Mr. Juran logged hundreds of thousands of air miles. In a typical case, Kopper Co. had a problem with a large portion of the piston rings it manufactured, which came out pitted. By carefully observing the production process, Mr. Juran discovered that one particular worker seemed to have the knack of producing unpitted rings, and set him to training all the others. At Xerox Mr. Juran said he found that senior managers, focused on balance sheets, were unaware of customer dissatisfaction with feature-rich machines that broke down too often. After a corporate shake-up remedied the problem, the comapny's new chairman gave Mr. Juran an award. He gave week-long retreats for management in America and abroad. But where middle-level management was typically the audience at home, when he journeyed to Asia the chief executives sat in. As a result, he lamented, quality control in America tended to consist of a limited project, while abroad it was treated as an evolving process. Mr. Juran felt that quality became a widespread management priority in America only in the 1980s. "A huge number of companies undertook initiatives, but only a tiny number of them succeeded," he told Fortune in 1999. Still, he was optimistic. Having witnessed the industrial history of most of the 20th century, he dubbed it the Century of Productivity. Next, he predicted, would come a Century of Quality. In 1981, he was awarded Japan's Second Order of the Sacred Treasure, the highest honor the emperor bestows on foreigners. In his memoir he wrote that one of his great regrets was declining to allow the Japanese Union of Scientists and Engineers to name an award after him. The group did name a separate award after Mr. Deming. Mr. Juran is survived by his wife, Sadie, who married him 81 years ago.